If you want to sell a diamond you should speak with one of our experienced diamond buyers. Our GIA Certified Gemologists can provide a free diamond appraisal to determine the value of any diamond. 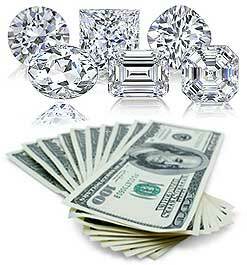 This allows us to offer the best price for diamonds, including loose diamonds or jewelry. We are known throughout the New England area for consistently offering top prices for diamonds. If you want to sell diamonds in Cambridge Massachusetts you should visit our store. We buy certified diamonds and non certified diamonds of all types. We buy loose diamonds and diamonds mounted in jewelry including wedding rings, engagement rings, bracelets, necklaces and more. We encourage you to bring in chipped or damaged diamonds, European and old mine diamonds. As part of our business we are also gold buyers and silver buyers. This allows us to accurately appraise the total value of your diamond jewelry. Bring us your loose diamonds or diamond jewelry for a free appraisal and price offer. Selling your diamonds is easy when you come to us. After we appraise your diamonds we will make you an on the spot price offer. We can cut you a check in minutes if you agree to sell us your diamonds. When you sell your diamonds here you can be in and out in 15 minutes, with cash in your pocket. If you are seeking diamond buyers in Cambridge Massachusetts you should take a short drive to Natick and visit our store. Diamonds come in many variations in size, shape and quality. A combination of factors determines the best price we can pay for your diamond. Jewelry pieces created by design houses carry prestige which may enhance the value of your pieces. A list of top diamond jewelry design companies whose designs we prefer includes: Cartier, Tiffany, and Harry Winston. Diamond appraisals are done using a formal process, including applying the standards of “The Four C’s“. Color, or lack thereof, does affect value. Diamonds are found colorless and with colors including black, blue, green, pink, red, yellow and various shades between. A formal diamond color scale is used to classify diamonds. The color scale ranges from “D” to “Z” with darker colors being considered fancy diamonds. Carat is the unit of measurement for a diamonds physical weight. One carat equals .20 grams. A carat used to measure gemstones is different than a karat used to measure precious metals. Clarity refers to the lack of visible flaws in a diamond. Almost all diamonds have such flaws, called inclusions. The diamond clarity scale includes grades of FL, IF, VVS1, VVS2, VS1, SI1, SI2, SI3, I1, I2, I3. Cut refers to the shape of the diamond, and specifically the angles and proportions. Cut is important first for general appearance and because cut determines how well light is reflected through the diamond. The reflection of light is referred to as a diamonds “brilliance” or “fire”. Traditional diamond cuts are asscher, cushion, emerald, heart, marquise, oval, pear, princess, radiant, round, trillion). Accurate grading is critical in order for you to get the true value of your diamond. The experts at The Gold Rush will provide you with a detailed explanation of the four C’s of your diamonds, and how these gradings contribute towards earning you the best possible price quote. As with all transactions, The Gold Rush will serve you with the utmost in courtesy and discretion when you are ready to sell your diamonds. I bought a GIA certified diamond ring from the Gold Rush and was highly impressed, not only did I get a good price but also an education on diamonds. I originally visited the Gold Rush to sell some gold and silver, its a great place to sell and buy jewelry.